ItemPlantagenet 042 - Vicinity of the Kalgan River, Kings River Shell & Parker Bays' and Oyster Harbor, Locations 7, 50, 28 & 21 by F.T. Gregory, Fieldbook 6 [scale: 10 chains to an inch]. ItemPlantagenet 043 - Vicinity of the Hay River Locations 62, 55, 60, & 10 (Molyelup) by P.L. Chauncy [scale: 8 chains to an inch]. ItemPlantagenet 046 - Kalgan River Locations 3, 4, 5, 6, 51, 53, 21, 38 by P.L. Chauncy, Fieldbook 2. Later addition of Location 400 and road [scale: 10 chains to an inch]. ItemPlantagenet 049 - North of Mount Barrow, Locations 15,16,17, etc by P.L. Chauncy. Locations 184 & 185 by H.S. Ranford & 272, 273 by Forrest and Angove [scale: 40 chains to an inch]. ItemPlantagenet 050 - Locations 41 & 54 at Noorubup on the Kalgan River by P. Chauncy [scale: 8 chains to an inch]. ItemPlantagenet 052 - Locations 43, 42 & later addition of road [scale: 8 chains to an inch, Tally No. 005476]. ItemPlantagenet 054 - Locations 2 & 33, vicinity of Princess Royal Harbour, by A. Hillman [scale: 8 chains to an inch]. ItemPlantagenet 056 - Location 32, Chauncy, Fieldbook 4, later addition of road [scale: 8 chains to an inch]. ItemPlantagenet 057 - Location along the Pallinup River, etc. by H.S. Ranford, Fieldbook 30, later addition by W.A. Saw [scale: 80 chains to an inch]. Item Plantagenet 050 - Locations 41 & 54 at Noorubup on the Kalgan River by P. Chauncy [scale: 8 chains to an inch]. Locations 41 & 54 at Noorubup on the Kalgan River by P. Chauncy [scale: 8 chains to an inch]. 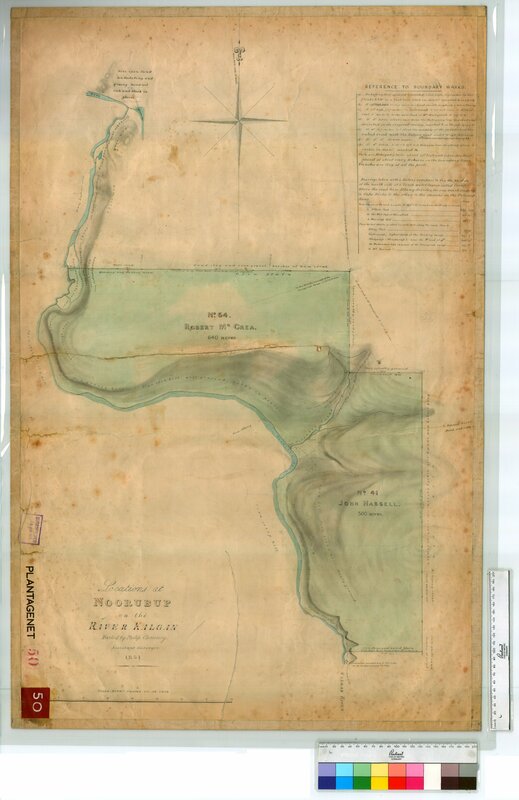 Confirm Item Request: Locations 41 & 54 at Noorubup on the Kalgan River by P. Chauncy [scale: 8 chains to an inch].